With 3 rows, 5 reels, 9 pay lines and 1 spin. You can bet 9 coins to be eligible for the pregressive jackpot. When you get 5 Pharaoh symbols on the ninth pay line you win the progressive jackpot. You only have to put in a minimum of $0.50, up to a maximum of $4.50! The only thing that this progressive jackpot slot machine doesn't offer are bonus games. Pyramid symbols are wild!! 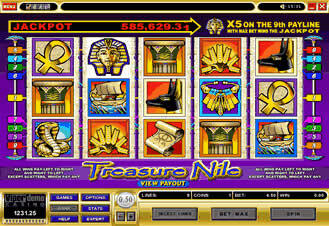 Being able to subsitute for any symbol to complete the winning combination with the exception of the scatter symbol, and the Pharoahs for the progressive jackpot. Scatter symbols, Scarab, can be used to finish a winning combination without being on the same pay line. Scatter wins are multiplied by the total number of credits bet. When you receive a scatter win and a normal win, you get paid for both winning combinatons. When you have 5 Scatter symbols the payout is multiplied by 50. When you have 4 Scatter symbols the payout is multiplied by 10. When you have 3 Scatter symbols the payout is multiplied by 5.